My blue theme for snacks on Oscar night only went so far. I made a blueberry crumble tart that I really enjoyed, and I tried a blue cheese and apple hors d’oeuvre that I ended up not loving. The third item I made completely abandoned that theme but was delicious. 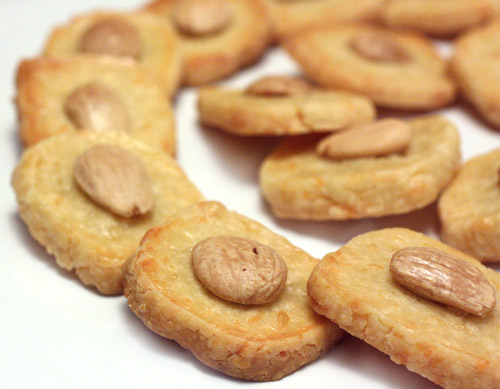 These manchego cheese crackers with marcona almonds are from The New Spanish Table . I just finished the book after reading it off and on since November when I tried a few tapas from it. There’s a lot of information in there. Anya von Bremzen covers regional preferences, historical facts, and modern takes on Spanish cuisine. There are many interesting side notes with explanations about ingredients and origins of dishes. Some of the recipes are very traditional, some are chefs’ contemporary twists on classics, some are more involved than others, and a few, like these cheese crackers, are simple ideas that she learned from friends. This recipe was given to her by Melissa Clark, and the intro note about how hard the crackers are to resist is definitely true. To make the dough, softened butter and grated manchego cheese were creamed together in the bowl of a mixer. Flour and salt were added, and the dough was supposed to form itself after a bit more mixing. Mine remained very crumbly and wasn’t sticking together at all, so I dribbled in just a tablespoon or so of milk and let the mixer turn a few more times until it seemed like dough. It was then formed into a log, and I flattened that into more of a long, square-ish shape which was wrapped in plastic and left to rest in the refrigerator for an hour. One quarter inch thick pieces were cut from the dough, and each was brushed with egg wash and topped with a marcona almond before being baked for 15 minutes. The crackers were crunchy on the edges and a little tender in the middle and full of great manchego flavor. Marcona almonds are pretty addictive all by themselves, and they made the crackers even better than they already were. This was a very basic cracker with just butter, cheese, and almonds for flavor, and I’m not complaining about that at all, but I was thinking about how it might be fun to add a little smoked paprika or a pinch of cayenne next time. all you need to say is 'manchego' and I am all over it! Mmmm, these would be great with some membrillo smeared on top, or maybe a drop of honey. That look very pretty and delicious. Great companion while watching the Oscar. These cookies would be good for any time! Mmmmmm... yummy! Please look away while I fill my purse with these delicious goodies. These look great and I sure you just can't eat only one! Manchego + Marcona - what a winning combo! Those crackers are terrific! Mmmhh, with a good bottle of wine! Oh my..I don't think I can stop munching on these! Yum!!! I haven't had manchego in such a long long long time. I remember making something similar once, but yours looks way better than mine. I'm not a big cheese person, but I absolutely love Manchego. And I'm not a big nut person but I absolutely love Marcona almonds. Looks like this is my ideal cracker. 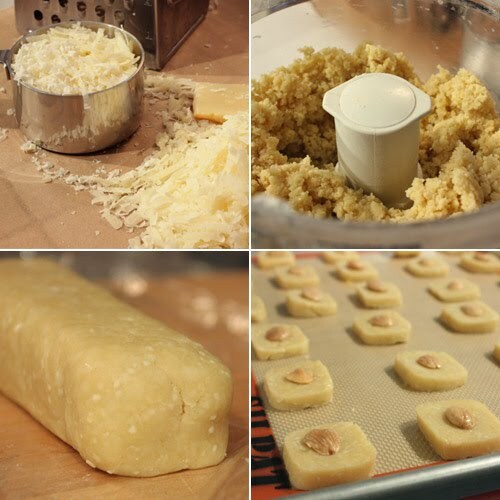 butter + cheese = happiness, and the almond on top is the perfect touch. tasty tapas indeed. These look soo good! I have to find a place to buy marcona almonds. Probably easiest online. This is a great recipe. Those are nice looking, I love marconas as well! 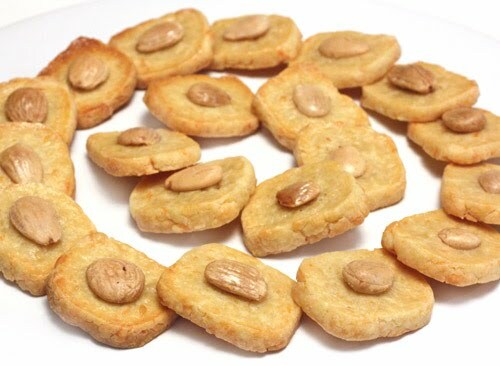 My family would so love these cheesy crackers with yummy marcona almonds, fabulous snack! I've made a couple savory crackers, Lisa, but not one like this. They look terrific and such a great snack to put out! Love marcona almonds! i WILL be making these...and soon! i'm a sucker for cheese coins and such. and a pinch of cayenne never hurt anyone. thanks for posting! manchego and marconas - sounds pretty good. I love cheese on crackers and often shy away from crackers that have cheese in them, but these look quite buttery and delicious. Along the lines of adding a bit of cayenne next time, maybe a bit of red pepper jelly on top? wow that looks like absolute heaven. mmm. I have not thought of manchego can be used this way, sounds like a great cookbook to have. Oh these crackers look so wonderful!! OH...these look awesome! I will put these on the menu for the next Girl's Night Dinner Club. With lots of red wine of course! Hope you are doing great dear !! Pls try to Participate in Give away in my blog which is going on right now . Marcona almonds are one of my fave things to just nibble out of hand. To use them to top cheesy crackers is pure brilliance. All the goodies you made for your Oscar party sound fab. I love savory cheese crackers. So addictive. I just saw these on your site and made them to take for Thanksgiving appetizer today. I took your suggestion and added 1/4 tsp cayenne powder and they are superb. Many thanks, I love your blog.